The images within this collection were carefully hand-picked from L. Ron Hubbard’s personal photographic archives—many never previously published—representing 10,000 hours of meticulous restoration to return these photographs to their original grandeur. Over 400 artifacts are beautifully displayed throughout these volumes, and include: L. Ron Hubbard’s typewriters, flying cap, mariner and fighter pilot’s licenses, pith helmet, rare coins and never-before-published Boy Scout keepsakes. From the profound treasury of Mr. Hubbard’s personal archives come the most comprehensive selection of articles and essays ever published. Included are over 100 articles on the subjects ranging from writing and photography to aviation and seamanship—not to mention the answers to Man’s eternal questions. L. Ron Hubbard’s diaries and journals provide still greater depth and color to a singularly exceptional life. 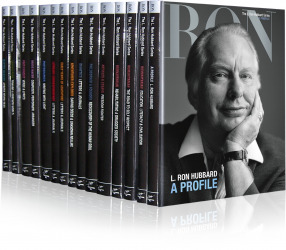 Throughout the 16 volumes, uncover some of his most evocative thoughts from a lifetime of adventure, exploration and discovery as he traveled an extraordinary journey to the founding of Dianetics and Scientology. Compiled from Mr. Hubbard’s personal archives is an extensive collection of letters. These letters are the personal correspondence between Ron and his many colleagues and closest friends. Extensive and easy-to-use indexes and glossaries are inside every volume.